While cruising around Dimension X, the Neutrinos decide to “buzz” the Technodrome. However, when they fly by, they notice that a cargo bay door is open and can’t resist the temptation. Inside, they tap into a transmission between Krang and Shredder on Earth. Through this transmission, the Neutrinos learn of Krang/Shredder’s latest plan to destroy the Turtles. The Neutrinos decide that they can’t sit idly by and watch, so they open their own portal and arrive on Earth to warn the Turtles. Before the Neutrinos can contact the Turtles, Shredder, who was warned by Krang of the Neutrinos presence on Earth and of their ability to open their own portal, sends Rocksteady and Bebop to “intercept” them and return them to his secret hide-out. The Turtles vainly try to follow, but crash their Turtle glider during the pursuit. 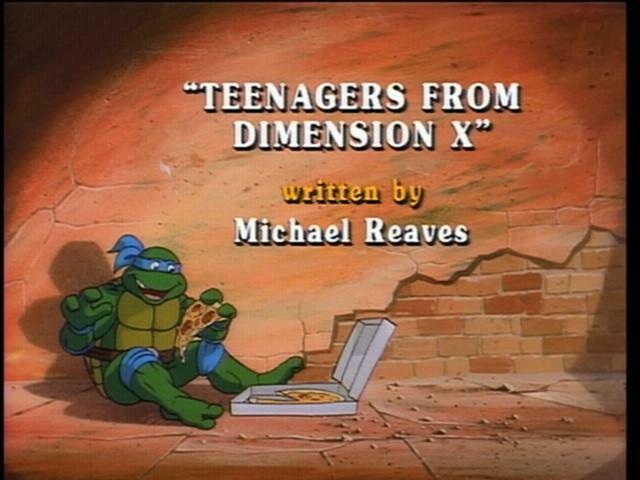 Later, Donatello develops the motorized skateboard and the Neutrino tracking device that enables the Turtles to rescue the Neutrinos from Shredder’s secret hideout – an abandoned amusement park. As they return to the Turtles’ Lair, the Neutrinos explain Krang/Shredder’s plan to turn them into mindless zombies and how they can neutralize the Mental Neurolizer with a flip of the switch on their dashboard. Only it doesn’t work. It seems that the crystal that powers their Star Mobile is cracked and can only be replaced by a crystal from Dimension X. Unfortunately, with the crystal broken, they can’t open the portal to return. Donatello is convinced that he can repair it and he locates a Particle Accelerator. Only the crystal heats up too fast, causing an immense power surge that Krang is able to “pick up” in Dimension X. He contacts Shredder with the exact location of the Neutrinos and the Turtles. Shortly after the crystal is repaired, Shredder, Rocksteady and Bebop are able to steal the Star Mobile (with the crystal) and capture the Turtles, leaving the unconscious Neutrinos to be recovered by April moments later, thanks to a distress signal from one of the Turtle’s TurtleComs that was accidentally triggered during the attack from Shredder and Company.